Experience the beauty and majesty of Handel’s beloved oratorio, “Messiah,” performed by the Choral Society of Pensacola at 7:30 p.m., Saturday, Dec. 3, at the Saenger Theatre, 118 S. Palafox Place. First performed in 1741, this musical meditation on the birth, passion, death and resurrection of Christ has earned a place as one of the best-known and most beloved works in the classical repertoire. “Messiah” also has played an important role in the history of the Choral Society, which grew out a performance of “Messiah” selections at a meeting of the Music Study Club of Pensacola in 1935. 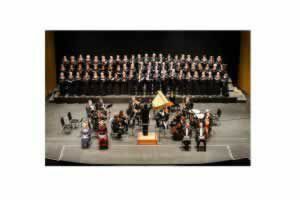 Over its 81 seasons, the Choral Society has presented the work, at least in part, every year. Audiences never fail to respond to the wide range of emotions expressed in the work’s varied solos and choral sections, including the familiar and inspiring “Hallelujah” Chorus. Popular soloists Carla Connors, Monika Cosson, Thomas Rowell and Patrick Jacobs return to perform with the 60-voice community choir and an orchestra comprising some of the area’s finest musicians, all under the direction of Xiaolun Chen. Tickets cost $30 and $35 and are available through Ticketmaster or at the Saenger box office. For more information, contact CSP Executive Director Charlie Smoke at 850-484-1806 or charlie@choralsocietyofpensacola.org.